Here’s something that you probably didn’t think you would ever do – building a garden inside of your house, rather than outside. Sure, you might be wanting to get outside and build an outside garden, but do you have any idea how much that work that takes? You’re going to have to spend hours and hours building up this garden and maintaining it. Instead, why not build that garden inside with any of the hundreds of indoor-gardening products on the market? Keep reading down below to learn some more about how you can accomplish this and work on those gardening skills. Freestanding vertical gardens are one of the more popular options when it comes to gardening indoors. And there are plenty that you can choose from on the market! The wooden stand of a vertical garden is going to offer you plenty of spaces to plant various herbs. Anything from basil to cilantro is going to be available to you year-round when you have a vertical garden hanging in your kitchen. Plus, this is going to be a seriously great decoration to add to any kitchen space. Imagine your guests walking into your kitchen and finding your super green and beautiful garden hanging on the wall, right within hands length. Amazing, right? Make sure they’re properly lit with LED lights so they grow, like those from Lumi Growth! Pretty much everyone reading this article has killed a plant or two in their life due to not watering them enough. And that’s completely fine – we all learn from our mistakes! However, there are some great products on the market that will allow you to grow plants and herbs inside. Plus, they normally come with touchscreens that give you automatic updates for when it’s time to water your plants or change out the soil. This is going to make indoor gardening a breeze! If you’re not wanting to add too much technology into your gardening life with a Harvest Touch, then you can go with a simpler Cedar Herb Planter that you can find online. This is going to be a simple wooden box that allows you to grow herbs inside and will fit right onto your kitchen windowsill. 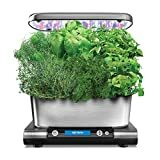 Not only does this making gardening inside super easy, it’s going to be an awesome decoration piece to add to your kitchen or whichever space you choose to grow your herbs in. With a Stack-in-Grow Light System or any other product like it, you can give seedlings a head start on the growing before you transplant them outside or into a pot indoors. You simply add in your seedlings and the light system will help them grow until you’re ready to move them. And all of this is done right indoors! You can even stack multiple units on top of each other to make the most of your growing space. 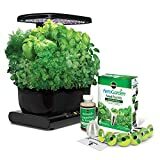 If you’re not going to be gardening for fruits or vegetables, but instead just want some beautiful plants indoors, then this one is for you. You can buy some hanging planters that match your room’s interior and hang up small succulents or plants from the ceiling. This is going to add a dash of color and depth to any room of your house and is a great way to get started with the flower or succulent life. Do a simple Google search and you’re going to find many planters that you can buy online! Having an indoor garden isn’t something that many people think of when they’re wanting to get started with gardening. However, this is a much easier way to start working on that green thumb than going outside and spending hours hunched over in the sun.